Ian Edginton hooked me from the get go. The first page is ominous and bloody, hinting that somewhere something has disastrously gone wrong and that things are most definitely not what they seem to be like. Then, from the second page on, we hit the main story as we are introduced to the two protagonists of this series, Prosper and Angus. Through them, we see how people live in this changed world, years after nature finally took back its due. Set in New York City, we see how irrevocably life has changed, how the world has gone back to the hunting and gathering stage of the human species’ development. As the story goes on, Ian Edginton keeps adding in one element after another to this world that he is creating and everything feels very spot on, very realistic. The world is full of some really amazing things, even if they can be a bit silly at times such as a Zebra being hunted in a forest at the top of a building in the city. Or not so silly, such as when Angus’ big secret is revealed, a secret that has some dire consequences for the young man. Prosper and Angus make for some really fun characters. They are both kids, essentially, although I’d peg them being in the 17-20 range. The banter between these two friends is really good, very natural, never forced. I’ve read some of Ian’s other work, such as his Aladdin graphic novel or his adaptation (from Japanese) Immortal: Demon of the Blood. From these, Hinterkind #1 is definitely a comic that I enjoyed, something that made me want to tune in next month for the second installment. Throughout this issue, Ian keeps the story moving along at a study pace, introducing new characters as needed, and ending the story on a really good cliffhanger that completely changes the playing field, so to speak. As cliffhangers go, it was definitely one of the betters one that I’ve read (or seen, as the case may be in addition to the normalcy). The art in this comic is from Francesco Trifogli with letters by Dezi Sienty and colours by Cris Peter. The artwork as a whole, is pretty good. It is detailed with lots of depth to each panel, lots of variety in how characters are drawn and how they behave. The colours are plentiful and lush, dominated mostly by the greens since there are so many scenes with the “forest” of New York City as the backdrop. And in general, the book has a very positive tone, a positive vibe, to it that I didn’t expect, considering the setting: a post-apocalyptic world. The colours go a long way in fleshing out that particular detail. And it kind of fits too since Prosper and Angus are setting out on a new adventure and they are very hopeful about the outcome. 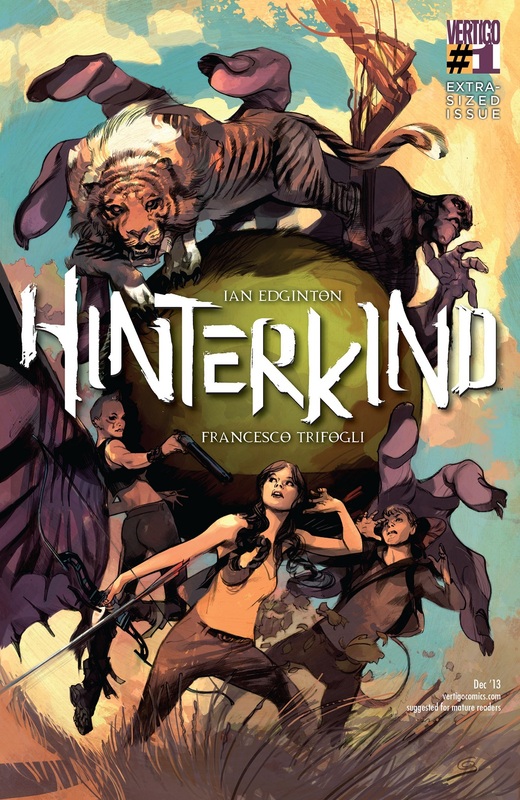 As far as first issues go, Hinterkind #1 is a fairly solid read. Its not the best that it could have been, but it is still fairly good. If things stay this way, then I don’t see why this can’t be one of the best comics being out by Vertigo right now. It definitely has all that potential, and then some. Plus, I really enjoyed the cliffhanger. Pretty much perfect and hints at what’s going to happen in the next issue, next month. Posted on October 7, 2013, in Comics Reviews, General, Review Central and tagged Comics, Comics Reviews, Cris Peter, Dezi Sienty, Francesco Trifogli, Hinterkind, Ian Edginton, Post-Apocalyptic, Review, Review Central, Vertigo Comics. Bookmark the permalink. 2 Comments.